A dental implant is an anchor that holds the artificial tooth in position. They mimic the appearance and function of a natural root of the teeth to hold a replacement tooth or bridge. Dental implants securely hold the artificial teeth in place and are not able to distinguish as a foreign object in the oral cavity. one or more prosthetic teeth. Subperiosteal: Subperiosteal implants are placed on the top of the jaw bone with metal framework that protruds through the gum to hold the prosthesis. These implants are used on those who have minimal bone height. Who are eligible for implants? Dental implants are used to hold in one or more prosthetic teeth. A patient with good oral health and quality jawbone is an ideal candidate for implants. Adequate amount of quality bone is required to support the implant. Dental implants are inserted into the gum tissues and allowed to fuse with the tissues and underlying bone in the oral cavity. The dentist and periodontist works together to plan the treatment procedure after evaluating the oral health condition. Depending on the specific condition and requirement of the client, the type of implant is chosen and a treatment plan is tailored to meet the patient needs. Replacing a Single Tooth: One implant and a crown are used to replace the lost teeth. Replacing Several Teeth: Implant-supported bridges are used to replace several missing teeth. Replacing All of Your Teeth: Implant-supported full bridge or full denture is used to replace all of the missing teeth. Sinus Augmentation: A successful dental implant insertion requires quantity and quality jawbone. The upper jaw area has least quantity of quality jaw bone is the most difficult part to place dental implants due to the close proximity to the sinus. In such cases, a sinus lift or augmentation is required to lift the sinus area to place the dental implant. The procedure involves raising the sinus floor and developing bone by inserting bone from other part of the body or artificial bone material. Ridge Modification: Ridge modification is a rectification procedure of any deformities in the upper or lower jaw that causes inadequate bone. During the modification, the gum is lifted and the defect in the bone is filled with bone substitute to build up the ridge. The procedure improves the aesthetic appearance and facilitates the successful insertion of dental implants. At IVORY DENTAL, we follow safe and reliable immediate loading basal implants technique for placing one or prosthetic teeth at affordable rates by a team of well-experienced and qualified dental surgeons. 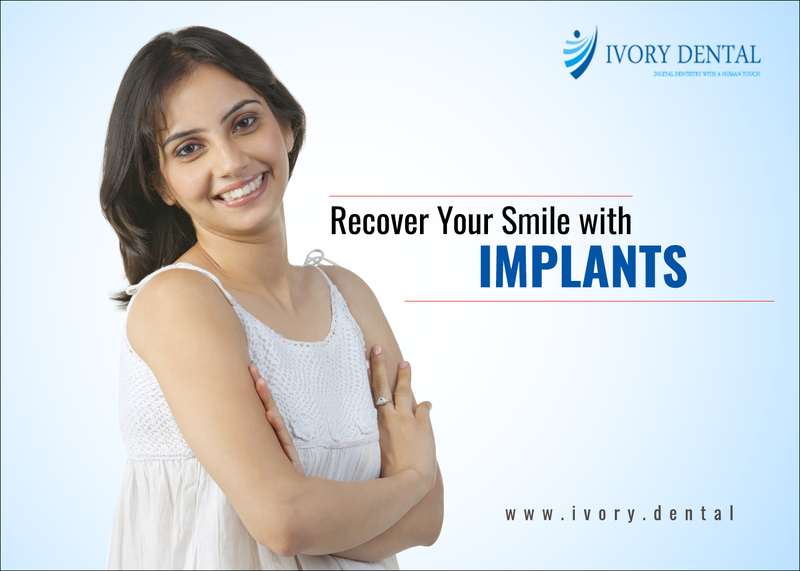 To know more about implant services and the best suitable implants depending on your condition and treatment cost, book an appointment now.